Table with secret well, on an adjustable stand! Here's a Black Art table complete with an adjustable base! You're all set to go with this one! What's a "Black Art" table? It's a table that uses a very effective principle of deception to allow you to vanish- or produce- an item whenever you want. The item is secretly vanished RIGHT INTO THE TABLETOP! This beautiful fringed table top has a unique design. 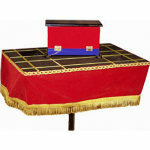 The ribbon design on the top disguises a "well", or hole, in the top of the table. Just push your item into the well- and the item is GONE from the audience's view! If you can push items into the holes, you can do the trick! Of course, this top is best used on a stage or at a distance. It won't be effective if your audience can see down into the top of the table. The size of the table top is approx. 14" x 14" by 5" deep. COMES COMPLETE WITH AN ADJUSTABLE TABLE BASE! Base can be set at any level from 22" to about 32" high. See the video below to watch how a black art table top similar to this one works! The table top and base show minimal wear. Direct from the estate of an amateur magician who took excellent care of his props. 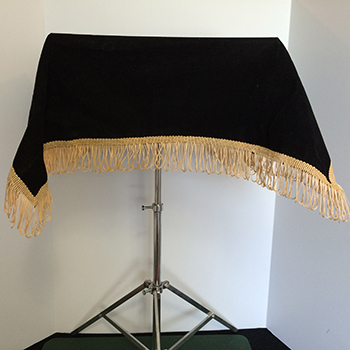 Table top is made of black felt and has a black velveteen skirt with gold fringe. Skirt folds easily under the top for storage. Tabletop is about 14" x 14" x 5" high. The well opening is 4" square and about 7.5" deep. The well pocket is made of black cloth. Tabletop is fitted with a metal flange so that a threaded pipe, such as the post for the Table Base, can be screwed right into it. Table base adjusts from about 22" to as high as 32". The height is easily and quickly adjusted with a knob. Here is a FREE video demo to teach you how easy it is to use a Black Art Table to make objects quickly vanish. Yes, we're revealing the "secret working" here, but for a good reason. You'll see that this amazing method of vanishing items is SUPER EASY for you to do. It's a centuries-old idea with a current application. Of course, you'll need a Black Art Table Top to perform this trick, and we're hoping after you see how easy it is, you'll buy one from us! The table top shown in this video is our BLACK ART TABLE TOP (also available in our store). The table available on this page works exactly the same way.